Imagine having row upon row of carrots, lettuce and tomatoes in your front yard. This organisation decided to turn homeowners lawns in Florida into rows of fresh local produce. Fleet Farming are a volunteer-led program that transform under-used lawns into lush edible farms. 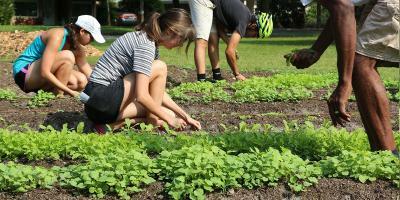 All of their volunteers ride bikes and go from lawn to lawn to seed and harvest the produce. Homeowners have the opportunity to donate their garden to the organisation. Once approved, they have to sign a two-year agreement and donate approximately $500 to cover start-up costs. In turn, the homeowners get a share of the produce. The rest is sold at local farmers markets. What’s even more amazing is that 100 percent of the sales go back into the organisation and cover the costs of irrigation, composts and seeds. Fleet Farming are growing and now have branches in Oakland, California and Kampala, Uganda. They also plan on expanding to more cities, as well as abroad.